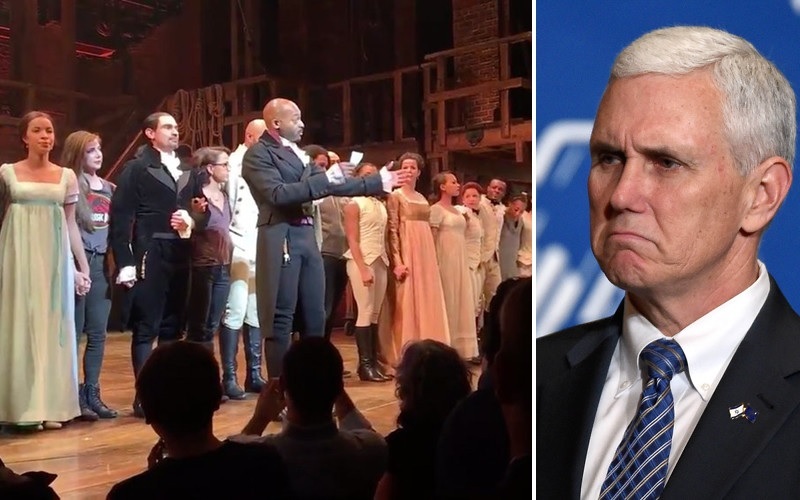 Vice President-elect said Sunday he “wasn’t offended” after the cast of the Broadway hit “Hamilton” called for the Indiana governor to uphold the country’s values in a personal message after a show. The Indiana governor said he’s confident the American people will see the president-elect be a president for all of the people. We embrace that principle,” Pence said. Hopefully we can hold Trump and Pence to this. Posted in Donald Trump, Entertainment & Leisure, Mike Pence. Tags: Donald Trump, Mike Pence. RSS feed for comments on this post.. TrackBack URL. "The hottest show on Broadway has won praise for its groundbreaking casting of black and Latino performers, but now, “Hamilton” may have run afoul of the strict New York City Human Rights Law. As CBS2’s Tony Aiello reported, the controversy was sparked by a casting notice posted by the producers of “Hamilton,” which specifically seeks “non-white” performers." Humbuggery of the first order! It is not really much of a controversy. One person made this claim which hasn’t received much attention outside of the right wing blogosphere. As the story reports, “The city Commission on Human Rights said it has not received a complaint about the ad, and would not say if it is investigating.” That was back in March, with no this claim not going any further.